If you are having your Corvette judged and prefer to use the original parts on your classic, or replacements are just not available, Paragon Vintage is your solution. Paragon Vintage can recondition many of the parts you need back to their original “like new” condition. We can strip, plate, or “e-coat” your worn or damaged parts, as well as, rebuild your electrical and/or mechanical parts. From bolts to distributors to carburetors, our staff is trained to correctly repair your original pieces. Due to the ranging original conditions and variety of reconditioning processes that are available we are unable to list pricing for this service. What parts can you recondition? 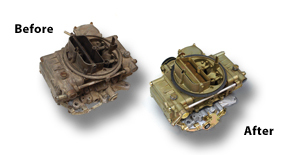 Paragon Vintage can recondition virtually any original part from your Corvette. 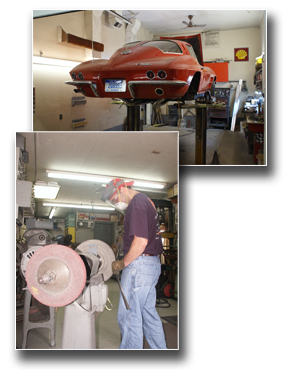 Moldings, gauges, window regulators, radios, and carburetors are just a few of the hundreds of services avalable. Will I get my original part back? When you send a part in for reconditioning, that part is marked with your customer number to ensure that you receive the same part back. How do I send my part(s) to you? In order for us to receive your parts and begin any reconditioning, we require that you call before hand and get a RMA number. This will allow one of our restoration specialists to go over the exact details of your reconditioning, as well as give you an estimated price. How long will it take to get my part(s) back? Due to the varying conditions and process' that are required for each part, an exact time table can not be given. Our specialists will give you an estimated time table based on previous similar jobs. We will keep you updated through out the process. Yes we do. We can custom chrome plate almost any metal parts, as well as other various plating demands such as zinc and yellow dichromate. Just give one of our specialists a call and they will be able to answer any specific questions.